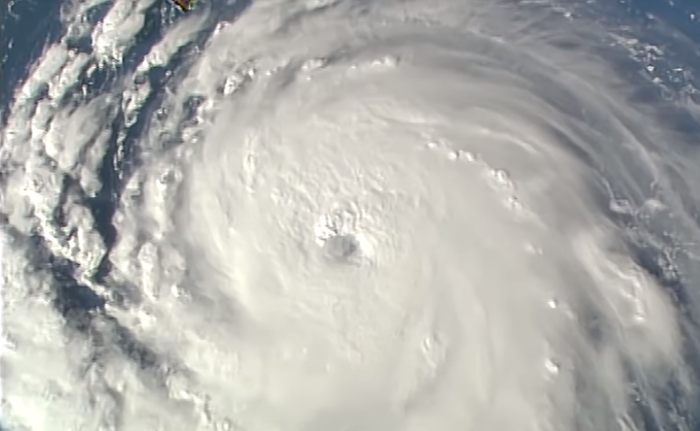 Churches in the Carolinas are now bracing for the arrival of Hurricane Florence as Dallas Pastor Robert Jeffress urged Christians to pray for those in the path of the ferocious weather system that scientists predict will likely wreak catastrophic damage. 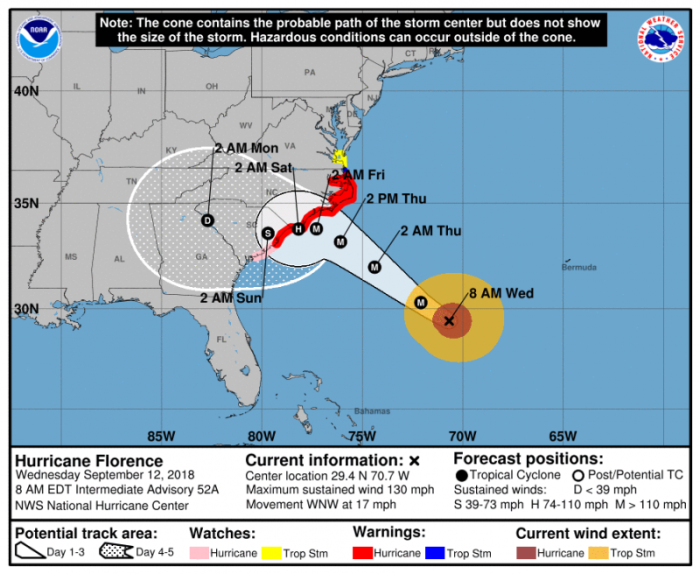 In their 8 a.m. advisory on Hurricane Florence Wednesday, the National Hurricane Center warned that it will be "extremely dangerous" when it nears the U.S.
"Florence is a category 4 hurricane on the Saffir-Simpson Hurricane Wind Scale. Strengthening is forecast through tonight. While some weakening is expected on Thursday, Florence is forecast to be an extremely dangerous major hurricane when it nears the U.S. coast," the NHC said. The National Weather Service also said Wednesday that Hurricane Florence is "very large and incredibly dangerous" and is likely to affect the Carolinas and Mid-Atlantic states this week into early next week. And as more than 1.5 million people were ordered to evacuate, FEMA administrator Brock Long said in a tweet Wednesday morning: "If you're told to evacuate for Hurricane #Florence and don't go, you're putting your life in danger. Today is the last day to travel; plan accordingly." A day earlier he added in another tweet "... it is crucial that you listen. Plan to be out of affected areas for an extended period of time as Florence will have extensive impacts." The North Carolina Baptists on Mission, which handles disaster relief for the Baptist State Convention, told BP News that they are preparing for the worst. "All of our equipment is being checked to make sure that everything is operational and road-worthy," Richard Brunson, executive director of NCBM said. "We haven't had a Category 4 hit North Carolina since Hurricane Hazel, 50 years ago," Brunson added. "It just depends where it comes in, but it's a very powerful hurricane that could be devastating, catastrophic. Those are the words they're using to describe Hurricane Florence." The Church of Jesus Christ of Latter-day Saints said in a statement Tuesday that missionaries serving in coastal areas in the path of the storm were being evacuated while other plans were being made to help with recovery efforts. While faith-based organizations such as Second Harvest Food Bank in Fayetteville, North Carolina, had amassed dozens of pallets of bottled water, meals ready to eat and supplies to help establish food kitchens, according to The Fayetteville Observer, some churches in the state said they would be following the lead of emergency management agencies. "We currently do not have any solidified plans for our response to the hurricane," Christopher Hale, a spokesman for Manna Church, told the publication. "We are directing people to follow the instructions from local officials and instructing our members to follow us on social media for updates and opportunities. ... As the situation develops we will know more how we can be of the best resource to our city in this time." Hurricane and storm surge warnings are in effect from the South Santee River, South Carolina, to Duck, North Carolina, including the Albemarle and Pamlico sounds. This includes Myrtle Beach, South Carolina, Wilmington, North Carolina, and most of the Outer Banks, The Weather Channel reported. Many other areas in the Carolinas are also under hurricane and storm surge watches. Scientists told CNBC that due to the flat nature of the coast line off of North and South Carolina, historic storm surges up to 20 feet could move far inland. "Yes the winds will be bad, but really the water is what will be deadly," Rob Galbraith, director of underwriting research for insurance firm USAA, told the network. "The type of inundation we are talking about here happens very quickly. Six inches of water can knock you off your feet and two feet of water can actually lift your car off the ground." Jeffress, pastor of the 13,000-member First Baptist Church of Dallas, called on Christians "everywhere" to join him in praying for those in the path of Hurricane Florence. "On behalf of all of us at First Baptist Dallas and Pathway to Victory, I call on Christians everywhere to join me in praying for those facing this deadly storm, both for the residents and for the first responders whose job is to run toward danger," he said in a statement Wednesday morning. "Pray for their protection from wind, storm surges, floods and their effects. Pray for their safety as they evacuate and for their strength when they return. Pray that God will replace their anxiety with the peace that passes all understanding. And pray that they will feel the Father's nearness to them, for 'the Lord is close to the brokenhearted and saves those who are crushed in spirit' (Psalm 34:18)," he said.